Framework for private sector engagement in adaptation (figure 1, page 14 of the report). This paper* draws on the experience of the Action on Climate Today (ACT) programme, a five-year initiative that works closely with governments in South Asia to develop strategies to build resilience to the impact of climate change, as well as global literature on engaging with the private sector to finance adaptation. It outlines projects undertaken in India and Nepal to identify lessons learnt and key enablers with regard to private sector engagement in adaptation. 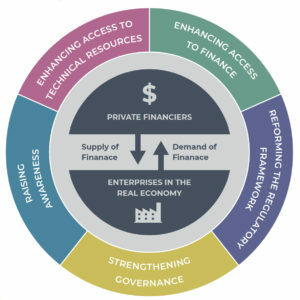 The private sector is envisaged as a broad and non-homogenous group; and, in this paper, private sector engagement refers to engaging with businesses from the real economy as well as private financiers – including banks, insurance companies and asset managers – to understand physical climate risks to businesses and investments, to unlock finance for private sector resilience. *Download the full paper from the right-hand column. risks and opportunities to the private sector. On the risk side of the equation, several elements threaten companies’ operations, which eventually affect their financial performance, in turn having an impact on financiers’ lending and investing activities. This provides a rationale for both types of private sector actors to identify and address such risks through the implementation of adaptation measures. Climate change also presents opportunities to the private sector, to capitalise on markets that may potentially expand, shift or newly emerge. However, identifying these opportunities does not imply that a changing climate should be regarded as a positive development. Opportunities arise from the identification, by companies in the real economy and private financiers, of their customers’ changing needs – through adaptation and resilience-building. There remain barriers to the private sector addressing climate risks and responding to the changing needs of customers as they adapt and build resilience (see table below). Barriers to private adaptation finance (table 3, page 11 of the report). Raising awareness of the private sector on climate-related risks and associated opportunities, through documentation and dissemination of the business case for climate change adaptation. Enhancing access to technical resources for the private sector to have the necessary capacity and expertise to address climate risks and seize opportunities by investing in climate change adaptation. Enhancing access to finance to improve the risk– reward profile of private sector investment in climate change adaptation. Reforming the regulatory framework to ensure policies, laws, and regulations create an enabling environment for private sector investment in adaptation. Strengthening governance by bringing together private, public and civil society actors to mainstream climate change adaptation in their decision-making processes and develop partnerships and collaborations. Showcasing the impacts of recent and local extreme weather and climate events as an entrypoint to spur engagement with the private sector. Speaking the right language by framing climate change around profit and loss, revenues and market share, rather than using a sole environmental perspective, when speaking with the private sector. Engaging the private sector in the development and implementation of adaptation policies and plans at an early stage to secure their buy-in. Promoting dialogue and building a shared vision between the public and the private sector to encourage them to work hand-in-hand with the government. Having access to the right network, expertise and resources to support private sector engagement in adaptation. Construct a foundation of narratives, using the private sector’s experience with a recent and local extreme climate event as a starting point and applying language tailored to businesses for them to relate to these events’ impacts on their activities. Build a shared vision between the public and private sector by identifying overlaps between the government’s priorities and private sector interests. Build the capacity of private champions by providing them with decision support tools to help them understand and assess risks and opportunities and/or identify potential adaptation measures. Bridge the gap between the demand and the supply of private finance by bringing together corporations that require lending to invest in the real economy and those that can provide finance (including large corporates, commercial banks, private financiers, the public sector and national/ international climate funds). Allow adequate time and resources for shaping governance and regulatory frameworks to provide an enabling environment for private sector investment in climate change adaptation and improve the risk–reward profile of these investments. Fayolle, V., Fouvet, C., Soundarajan, V., Nath, V., Acharya, S., Gupta, N., Petrarulo, R., 2019. Engaging the private sector in financing adaptation to climate change: Learning from practice. ACT.